Totally new fresh graphics and better supportfor different display sizes!! FREE, SIMPLE, NO ADS, STAYS ALWAYS ON! Very simple wall timer like WOD workout timer for intensivetraining. The screen keeps on and additionally you can keep countof your own rounds or if your calculating for a friend. With counter buttons you can count repeats and rounds, pressinground button reset repeat counter so you can easily get result like5+2. Application keeps screen on as long as the application isrunning, so this is perfect for long workouts and to be placed on awall with a power supply! This application is meant to be personal or replace expensivewall timers with cost effective setup made possible by cheapAndroid tablets. Application has been tested with some different screen sizes, soif you have any problems please report us the device and send ascreenshot if possible. Application is perfect for Crossfit trainers, Crosstraining,HIIT, Running, Circuit etc. Totally new fresh graphics and better supportfor different display sizes! !FREE, SIMPLE, NO ADS, STAYS ALWAYS ON!Very simple wall timer like WOD workout timer for intensivetraining. The screen keeps on and additionally you can keep countof your own rounds or if your calculating for a friend.With counter buttons you can count repeats and rounds, pressinground button reset repeat counter so you can easily get result like5+2.Application keeps screen on as long as the application isrunning, so this is perfect for long workouts and to be placed on awall with a power supply!This application is meant to be personal or replace expensivewall timers with cost effective setup made possible by cheapAndroid tablets.Application has been tested with some different screen sizes, soif you have any problems please report us the device and send ascreenshot if possible.Application is perfect for Crossfit trainers, Crosstraining,HIIT, Running, Circuit etc. In unserem HIIT Timer seid ihr nicht an vordefinierte Workoutsgebunden. Erstellt einfach euer eigenes Trainingsprogram!Mit einemsimplen Drag-and-Drop Trainings-Baukasten könnt ihr schnell euerpassendes Workout zusammenstellen. Ihr könnt natürlich auch denTimer einfach so nutzen, ohne spezifische Übungen.Wir arbeitenimmer weiter an der App und hoffen in Zukunft alle noch nichtaufgefunden Fehler zu beheben und tolle neue Featureshinzuzufügen.Viel Spass wünschen wir euch!In our HIIT Timer you arenot tied to predefined workouts. Simply create your own TrainingProgram!With a simple drag-and-drop training kit you can quicklyassemble your matching workout.Of course you can simply use thetimer so without specific exercises.We work continuously on the appand hope to fix it in the future, all is not found errors and addexciting new features.We hope you enjoy yourselves! Tabata Stopwatch Pro is the ultimate Tabata Interval Timer thatworks for 'all' your interval training needs. You can use it withTabata, HIIT, kettlebells, bodyweight exercises, interval running,sprints, etc. 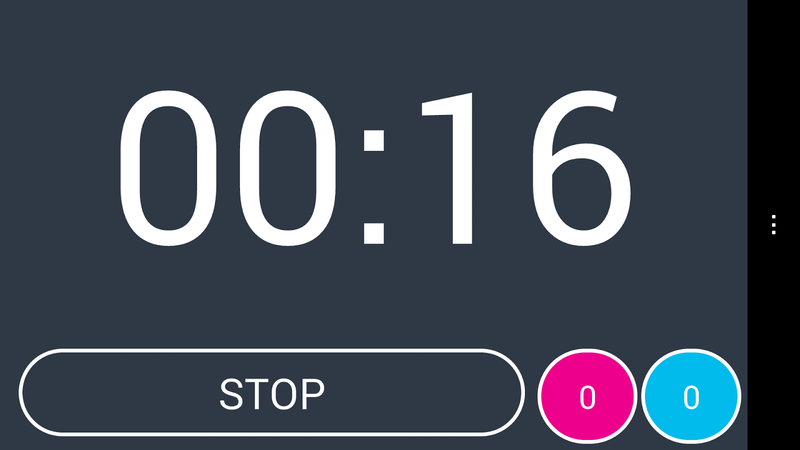 Tabata Stopwatch Pro is a universal (both Androidphones and Android tablets) feature packed interval timer forpeople who follow the Tabata training method. The main thing theTabata app will aid you with is automating your exercise, rest,cooldown and other intervals. As simple as this sounds, it has aprofound effect on your workout. You will be able to concentratemuch better, won’t have to constantly count and honestly the wholeworkout just goes by faster. Try it with your Tabata, HIIT,kettlebells, bodyweight exercises, interval running, sprints, andother workouts. Designed with both beginners and advanced users inmind Tabata Stopwatch Pro comes ready to use with basic Tabataalready set up for you. As you gain more experience you cancustomize all intervals to match your pace. You may even create andstore your own interval presets to quickly change to differentworkouts. Tabata Stopwatch Pro is loaded with beeps that helpidentify what part of a workout you are in, interval beeps forexample tell you when a new interval has started. Tabata StopwatchPro also has voice support that announces intervals to further helpyou focus on your workout. Oh and what would an exercise app bewithout music, select your favorite tracks and blast through thatworkout. The Google Fit app is supported and the Tabata app willwrite your Tabata workout times, calorie burned estimates and heartrates (needs a chest strap heart rate monitor and Pro purchase)after each workout. By far the best app for Tabata trainingavailable for your Android devices, Tabata Stopwatch Pro includes:+ Pro grade Tabata timer. + Ready to use out of the box. ClassicTabata already set up for you. + Simple to use, just push play. +Works on all Android phones and tablets. + Comes with 2 beautifulthemes. + Color coded display visible from afar. Colors representthe amount of energy you are using in an interval. + Customizeinitial countdown and warmup time. + Customize exercise, rest,recovery and cooldown intervals. + Adjust the number of sets andcycles to match your pace. + Jump between intervals in the middleof a workout as needed. + Build presets to support your multipleinterval training needs (Pro purchase needed). + Pause yourworkouts if needed. + Works with the screen locked and in yourpocket. + Interval beeps for each individual interval. Need aseparate beep to mark when it's time to rest, no problem. +Interval vibration. + Continuous beeps. + Three second beeps. +Halfway beeps. + Voice assist so that you focus on your workout andnot the screen. + Workout to music. + Set music to pause to hearbeeps and voice assist clearly. + Shuffle tracks or albums to suityour taste and workout. + Google Fit support. Pro Features: Somefeatures of the app require a paid Pro Features In App Purchase.These include saving more than 2 presets, no ads, access to voiceassist and announcement settings, the ability to use chest strapheart rate monitors, more sounds and improved music settings. Youcan find out more about these by clicking on the GET PRO button inthe app settings on the top right. This IS the best app in it'sclass, just have a look at the reviews. Health Disclaimer:Exercising can be extremely stressful for the body, please consultyour doctor, trainer or coach before using this app. This app doesnot aim to teach, coach or guide you with fitness, exercises orworking out. It is a utility for people (adults only) who alreadyknow what they are doing and why. Further, calculations for workouttimes, calories burned and heart rates when working out are onlyapproximations and should not be used for any medical purposes. Completely ad-free! Perfect timing for all situations of daily(sport) life with this HIIT interval timer app! FEATURES: * CreateTimer with different phases: * Warm Up * Workout * Pause * Resttime * Cool-Down phase * Google Fit Integration * Speed tracker viaGPS (location service) * Heart rate monitor HRM devices support(Bluetooth Smart 4.0 / ANT+ / Mi Band 1 / Mi Band 2) * Enter yourtarget heart rate * Backup function * Select for each phase aseparate alarm * Choose your own music as a background duringtraining * Plan your workouts with calendar entries * All completedworkouts can be visualized in the calendar * Timer running in thebackground (screen off), to reduce accu consumption * Real-timealerts for lock screen and status bar * Audio / Vibrations / VoiceFeedback: the view of the smartphone is not necessary * Create yourown timers, save and use these again and again * Determine sets ofworkout and pause phases and how often you want to repeat this *Display of total time and remaining time * Support landscape modefor tablets (activate in settings) * Speech output of completedsets or to the respective phases of the workout * No ads, nounnecessary permissions The Tabata Timer app is more than just astopwatch. Whether you workout in yoga and meditation exercises orlearning: Define multiple timers on your smartphone, store them anduse them again and again. Define your time intervals (preparation,workout, pause) itself and showcase your custom workout together.Connect your heart rate monitor device with the app and check yourpulse (Bluetooth Smart, Bluetooth LE, Bluetooth 4.0, ANT+ or yourXiaomi Mi Band). In addition, maximum and average heart rate duringthe workout will be displayed. Your pulse values during workout arealso recorded in the calendar. Optimal Training range perindividual pulse zones adjustable. Alerts via sound or speechoutput for exceeding or falling of the target heart rate. Use thissport timer app in addition for your training in the gym withweights, kettlebells, for spinning, jumping jacks or for many otherfitness activities! Perfect for sport like interval training,boxing, martial arts, crossfit, freeletics, HIIT, MMA, tabata,cycling, running, sprints, push-ups, weightlifting and otherfitness activities. Use this fitness timer for training in the gymwith weights, bodyweight exercises, TRX, spinning, calisthenics,jumping jacks, boot camp, circuit training, or any other highintensity intervals training. Connect with Google Fit andautomatically track all your workouts and activities. Choose one ofthe over one hundred activities to personalize the training and tosynchronize with Google Fit. WIKI information: High-intensityinterval training (HIIT), also called high-intensity intermittentexercise (HIIE) or sprint interval training (SIT), is a form ofinterval training, an exercise strategy alternating short periodsof intense anaerobic exercise with less-intense recovery periods.HIIT is a form of cardiovascular exercise. Usual HIIT sessions mayvary from 4–30 minutes. These short, intense workouts provideimproved athletic capacity and condition as well as improvedglucose metabolism. Compared with other regimens, HIIT may notbe as effective for treating hyperlipidemia and obesity, orimproving muscle and bone mass. Some researchers also note thatHIIT requires "an extremely high level of subject motivation," andquestion whether the general population could safely or practicallytolerate the extreme nature of the exercise regimen. Metaboliceffects: HIIT significantly lowers insulin resistance compared tocontinuous training or control conditions and leads to modestlydecreased fasting blood glucose levels and weight loss compared tothose who do not undergo a physical activity intervention. Thecountdown is running!